My latest cooking contest endeavor is the “Stir It Up Holiday Blogger Mixology Challenge” hosted by Stirrings and if proving to be a fun way to kick off the holiday season. 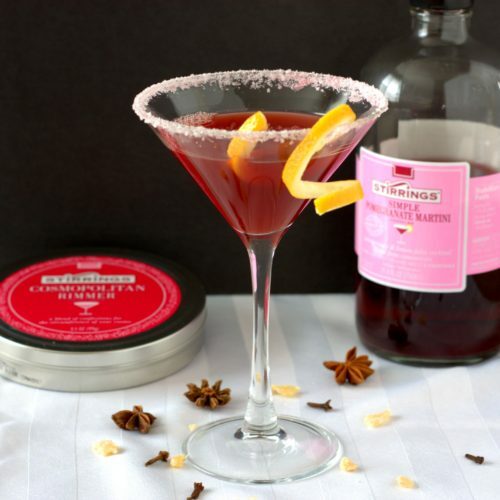 Stirrings makes premium cocktail mixers and rimmers and challenged bloggers to develop a creative, attractive, and delicious holiday cocktail. One of the first things that comes to mind for a go-to holiday drink is a warm and spiced concoction. 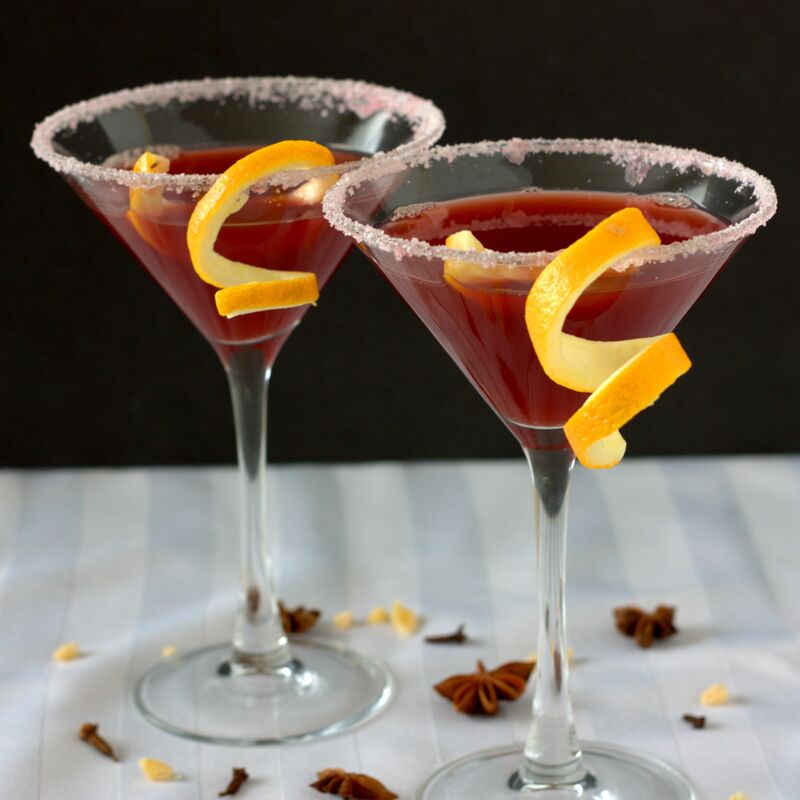 To add to your winter beverage repertoire I off the Mulled Pomegranate Martini. Mulling means to sweeten, spice, and warm a drink. For this cocktail I mulled the Stirrings® Simple Pomegranate Martini Cocktail Mixer and orange juice with cloves, anise, nutmeg, and ginger. After simmering for a few minutes, the mixer is strained and combined with a cinnamon-sugar vodka to add depth to the spice profile. 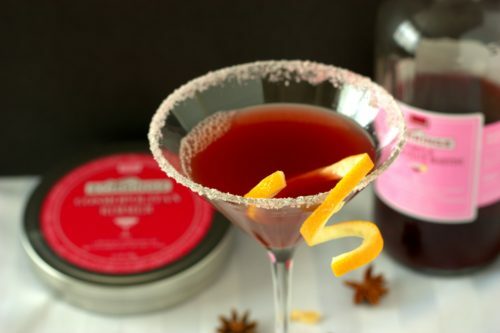 The end result is a Mulled Pomegranate Martini that is a well-rounded delight. 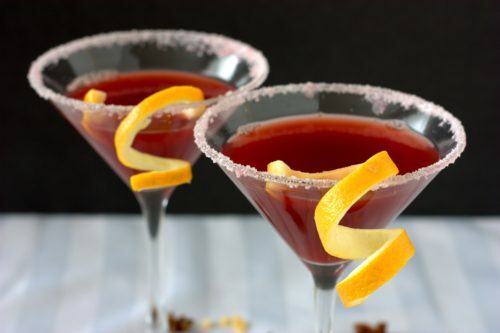 The martini is served in a martini glass rimmed with Stirrings® Cosmopolitan Rimmer (which adds color and a slight hint of citrus) and garnished with an orange peel twist. I can’t wait to experiment with the other Stirrings® products. You can find additional recipes on their social media sites (Pinterest, Instagram, Twitter, and Facebook). Some of the locations that sell the Stirrings® products include: Hazel’s Beverage World, Davidson’s Liquors, Argonaut Wine & Spirits, Keg Liquors, Whole Foods Wine & Spirits, and Applejack Wine & Spirits. Rim two martini glasses with Cosmopolitan Rimmer. Place the pomegranate mixer, orange juice, cloves, anise, nutmeg, and ginger in a medium sized, non-reactive sauce pan. Bring to a simmer and simmer for 10 minutes (liquids will reduce by 1/3). Remove from the heat, strain, and add to a cocktail shaker along with the vodka and shake vigorously. Pour into the rimmed martini glasses, dividing the drink evenly between the two glasses. Garnish each glass with an orange peel twist and serve. My family and I just returned from a vacation in California. On vacations, I try to frequent off the beaten path restaurants and managed to do so in South Lake Tahoe. One of the restaurants we tried was a German restaurant which offers homemade wursts and other German fare, and imports 30 different German and Belgian beers. The homemade mustards were fantastic, but what intrigued me the most was the curry ketchup that was served with the pomme frites (which were also served with mayonnaise, an authentic Belgian accompaniment). 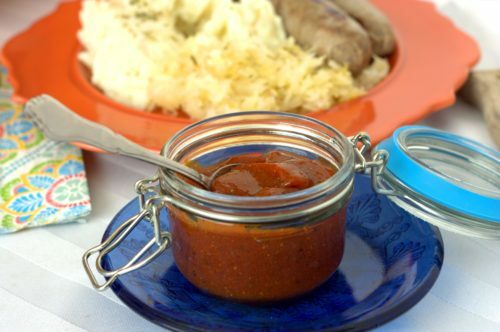 I decided to research curry ketchup and was surprised to find that curry ketchup is a common sauce served in Germany, Belgium, and the Netherlands. A popular bottled brand is Hela, though most recipe sites list mixing 4 teaspoons of curry powder to 1 cup of ketchup as a quick at-home version. The homemade curry ketchup from the restaurant had a bit more depth, so I decided to try a few other stir-ins mentioned on The Kitchen Maus. 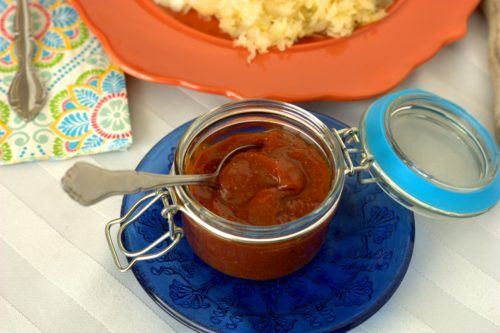 For my quick Curry Ketchup, some curry powder, honey, and Worcestershire sauce is all it takes for a new spin on a favorite condiment. I look forward to when I can vacation in Europe and return with even more unique recipes! In a small bowl, combine the ketchup curry powder, Worcestershire sauce, honey, and black pepper until smooth. 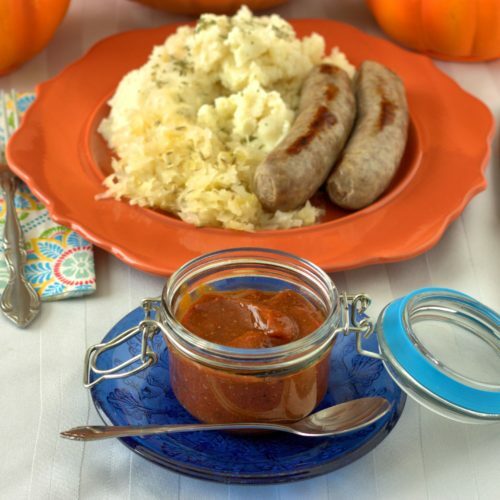 Serve with fries or sausages; refrigerate leftovers. Every now and then I find an interesting ingredient at the supermarket. 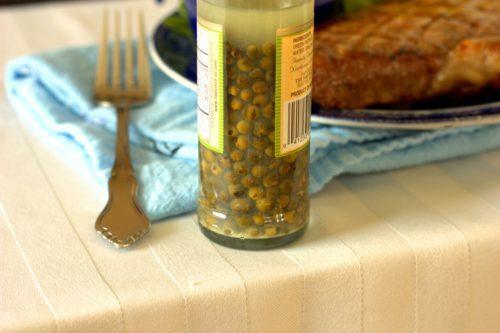 Most recently, I went to grab a jar of capers and came across brined green peppercorns. I had no idea what they were used for, but I’m sure it comes as no surprise that I just had to buy some to give them a whirl. I did a little online searching and the most typical use is in green peppercorn sauce that is paired with steak. Most recipes call for a heavy cream, but I chose to use cream cheese for easier dipping and a slightly healthier sauce. 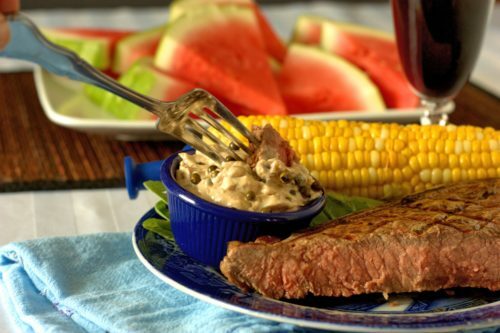 Once we tried the Green Peppercorn Sauce my husband declared it his new favorite steak sauce. If I let him, I think he would smear it on all things beef. If you are looking for a new take on steak sauce I highly recommend you give this a try. Oh, and one last tip. Don’t forget that even though these are brined it IS peppercorn – if you bite into one you are in for an intense “treat”. Add the butter to a sauce pan and melt over medium high heat. Add the shallots and garlic and saute for 2 minutes until fragrant and soft, then add the stock and peppercorns. Once it comes to a boil, add the cream cheese and stir to incorporate. Once the cheese is mixed in, remove from the heat and add the sherry; keep warm until ready to use. Refrigerate any leftovers. A few weeks ago I mentioned that I was trying to prep more food on the weekends to make for easier lunches and no brainer dinners. With this in mind I have been trying to make a variety of salads – rice, lentil, steel cut oats, etc. My strategy has been to create salads with a good mix of vegetables, fiber, and protein to hopefully provide an interesting lunch while maintaining my energy through the day. 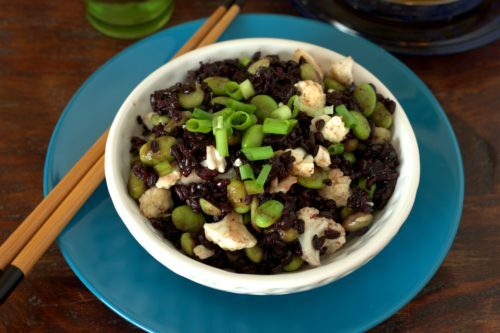 The salad I want to share today is my Black Rice & Edamame Salad. Black rice has higher protein, fiber, and iron content than most other rice varieties and is high in antioxidants. 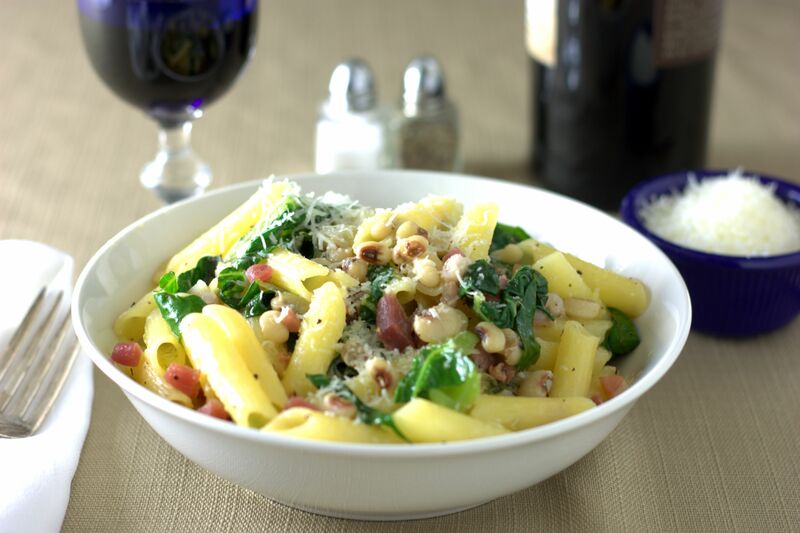 It has a nutty flavor which makes it a delicious base to build from, and the unique color helps make the dish fun and fresh. 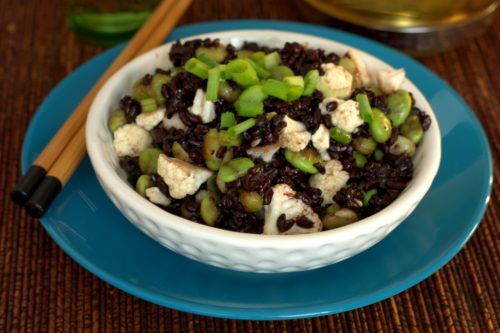 To balance the dark color of the rice I added fresh cauliflower and edamame. Not only is the color contrast visually appealing, but I enjoyed the different textures of the salad (chewy and crunchy at the same time) as well. I dressed the salad with a light Asian inspired sauce. 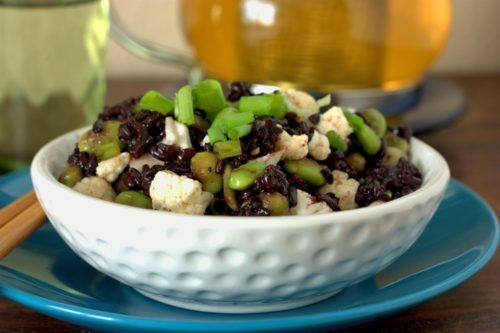 The soy sauce, ginger and garlic was just enough to compliment the salad without smothering the great flavors of the black rice, edamame, and cauliflower. 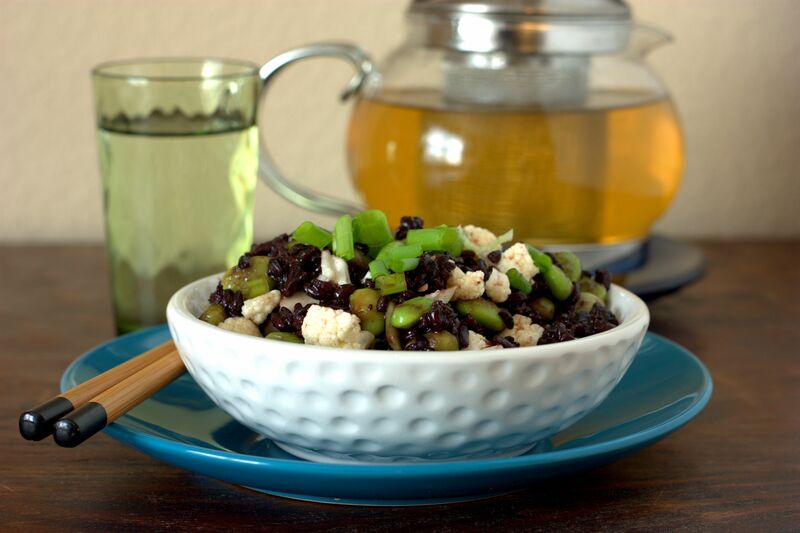 I hope you enjoy my Black Rice & Edamame Salad as much as I did. Don’t be surprised if you see more salad recipes in the upcoming weeks! Rinse black rice until water comes out clear, than add to a large pot with the water. Bring to a boil then reduce heat and simmer uncovered until the water is absorbed and the rice is tender and chew, about 30 minutes. Remove from the pot and add to a large bowl. Meanwhile, cook edamame according to package directions, drain if necessary, and add to the black rice along with the cauliflower and green onions. In a small bowl mix together the oil, soy sauce, honey, salt, ginger, and garlic and then pour over the black rice salad. At the beginning of June my family went on a quick weekend trip to Breckenridge, CO. The few times we have been there we have enjoyed perusing the used bookstore, Old Man Berkins, and tasting the vinegar and oil at the specialty oil store, Oil Fusion. On this occasion, the specialty oil store had samples of popcorn sprinkled with their truffle salt for customers to enjoy. I must say that it worked for my family – we now have a renewed interested in freshly made popcorn sprinkled with flavorful salts. True, the pre-purchased microwave popcorn bags are easy. But did you realize that in about the same amount of time you can pop popcorn kernels in the microwave using only a microwave safe bowl and plate? You then get to customize your flavor, using actual butter and whatever topping you choose. In addition to the truffle salt, we also really love the alderwood smoked salt that I wrote about in my homemade butter experiment. This week I tried mixing a variety of savory herbs and spices: celery salt, garlic powder, dried basil, and black pepper. The possibilities are endless – who knows, I may use pink sea salt, Creole salt, or another concoction next. In a small bowl, mix together the celery salt, dried basil, black pepper, and garlic powder; set aside. 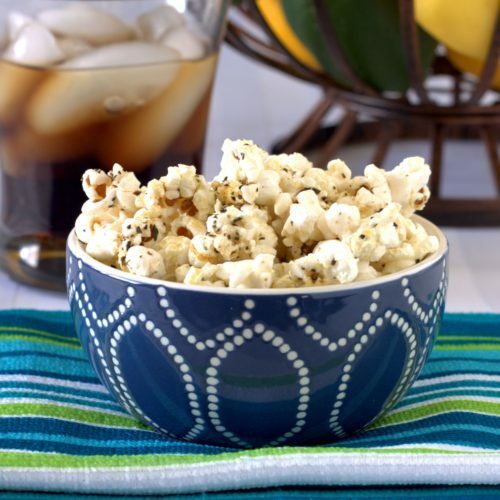 Place popcorn in a large microwave safe bowl and cover completely with a glass, microwave safe plate. Microwave on high for 4-5 minutes, or until the time between popcorn pops is about 3-4 seconds. Using oven mits, remove the bowl from the microwave. Pour the butter over the popcorn, tossing to coat. Sprinkle on the salt mixture and toss to coat. Serve; makes 5 cups. Note: if using an already flavored salt, use ½ teaspoon of the pre-packaged salt in place of the salt mixture above. (1) I may have overbought a variety of fresh fruit this past week. Peaches were a steal and it had been awhile since we had eaten papaya. This was in addition to the wealth of apples, cherries, blueberries, and strawberries that I had stocked. (2) My daughter wanted to make a special treat to enjoy with her neighbor friends. She had suggested muffins or cupcakes. Since it is the middle of July I wasn’t keen on the idea of firing up the oven, so sly mom that I am, I offered up the mommy-wants-to-use-up-excess-fruit smoothie idea instead. 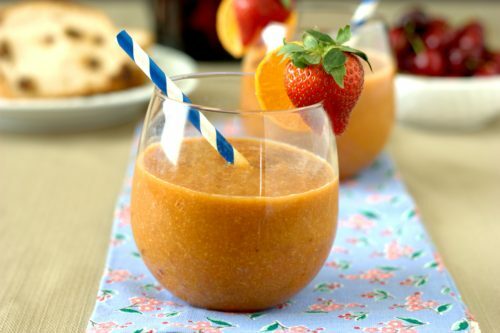 Keeping the smoothie simple, I used my food processor to blend papaya, peaches, almond milk, honey, flax meal, and Saigon cinnamon into a delicious treat that the whole family enjoyed. 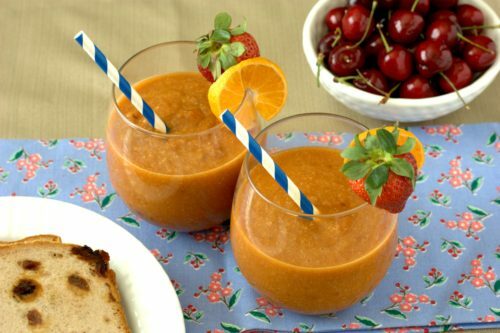 The mix of papaya and peaches was the perfect blend of exotic and sweet tastes. 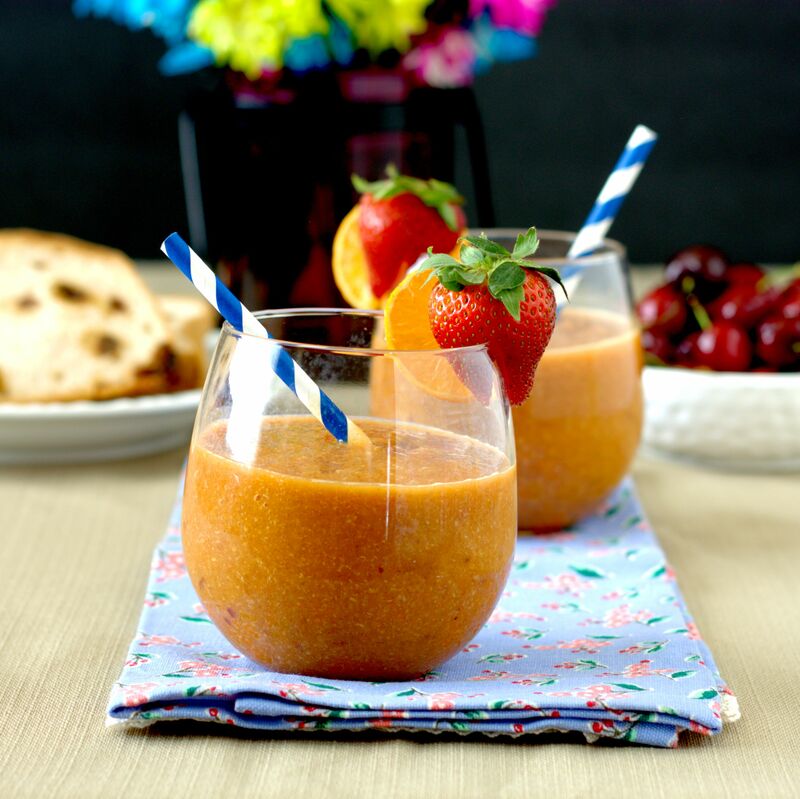 Just like in my Orange Creamsicle Kefir Smoothies, the flax meal amps up the omega-threes and fiber to make this Papaya-Peach Smoothie a healthy breakfast alternative. Now I just have to eat my way through the rest of our fruit! Add the papaya and peaches to a food processor or blender and mix until smooth. Add in the rest of the ingredients and process until smooth again. Every now and then the wellness program at my office highlights a challenge. The one starting this next week is to eat 3 servings of vegetables and 2 servings of fruit in the colors of the rainbow for a whole month. Doing so (and logging my progress) earns me points towards a better health care plan rate, but I also see it as a great reminder to vary my fresh food. We sometimes get in a rut, such as always grabbing an apple or carrot sticks for lunch. When you stop and think about it though, how much blue or purple food do you eat? Probably not much, which I had demonstrated with my Does Color Effect Taste Experiment, but there are other options besides blueberries. Take, for instance – purple cauliflower. Like many other blue/purple veggies and fruit it gets its color from anthocyanin which is thought to help reduce chances of cardiovascular disease and cancer. It is also the chemical behind the acid-base indicator made from cabbage. 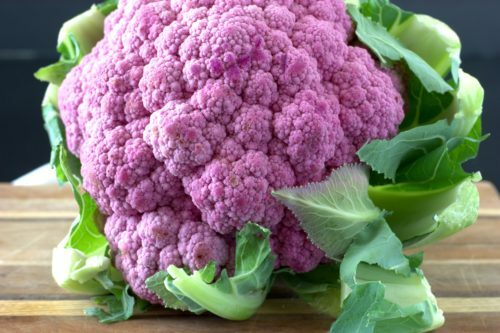 You may notice the cauliflower gets a pinkish hue when you add the lemon juice in this recipe as a result of the lower pH in that area. 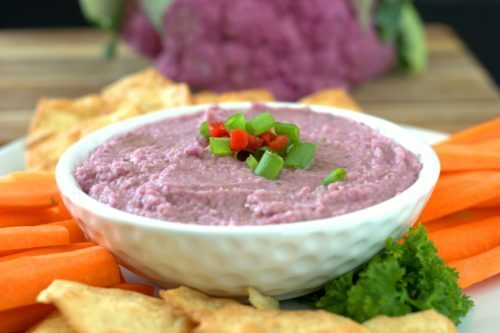 Chemistry aside, I used the purple cauliflower to make a unique, light take on hummus. 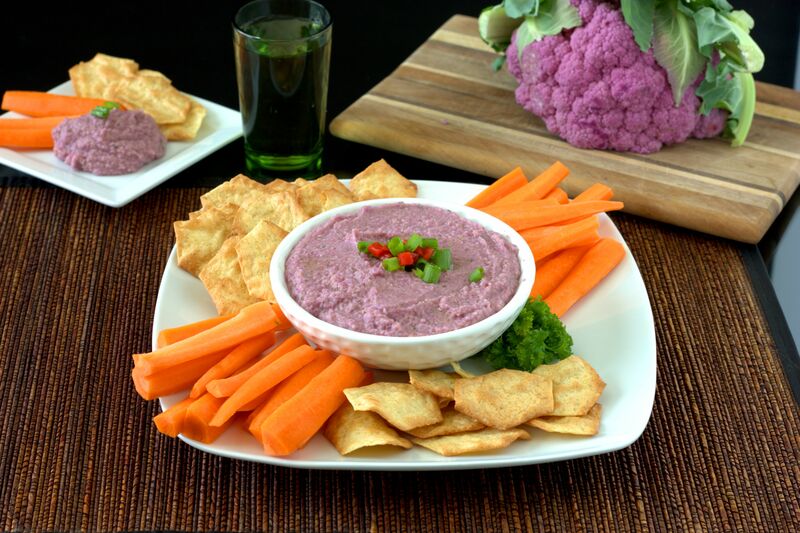 Mixing in the cauliflower not only gave the dip color, it also adds a sweetness to the snack. I enjoyed this with carrots and crackers, so be creative (or sneak in another color). I’m sure you will see some other challenge inspired dishes over the next month. Add the cauliflower and garbanzo beans to a food processor and process until finely ground. Add the lemon juice and the olive oil and continue to process until smooth, scraping down the sides if necessary. Once smooth, stir in the salt, garlic powder, basil, and fenugreek. 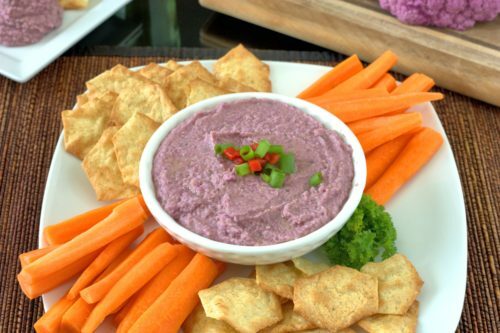 Serve with crackers, chips, or carrot sticks. If you often get bored with the typical dinner sides of rice and potatoes, then you will like trying this ancient grain as much as I did. 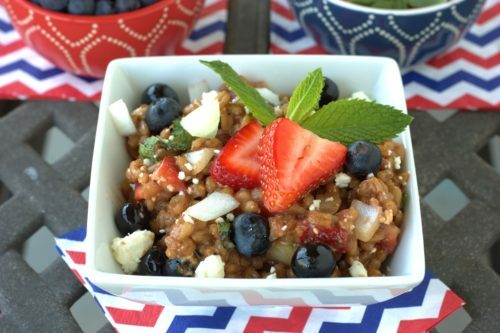 Farro is a hulled wheat that provides a good source of fiber, protein, and magnesium among other nutrients. When cooked, it has a chewy texture and a nutty flavor. 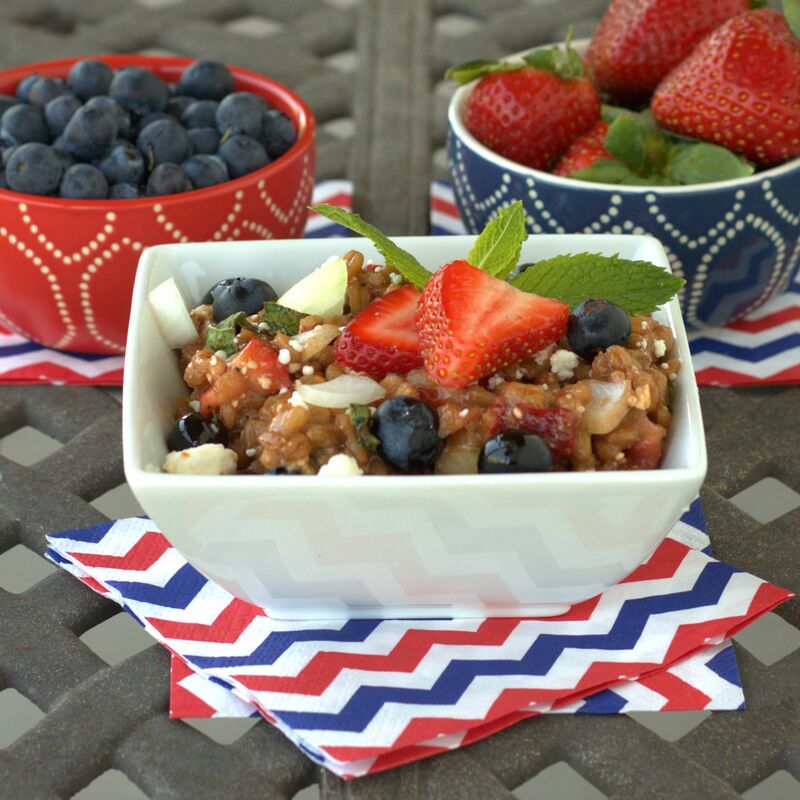 I used it to create a Farro and Mixed Berries Salad that was both refreshing and delicious. I also thought it would be a fun side dish for 4th of July parties by mixing in a bit of red, white, and blue through my add ins. 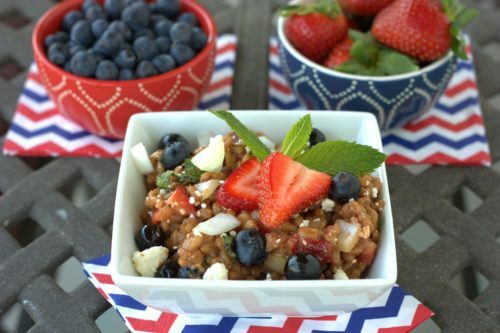 The strawberries and blueberries add a pop of color and just the right amount of sweetness, whereas the onions and feta add enough savory balance. Who knows, the unique grain might also serve as a great conversation starter during your meal! Rinse the farro, then add to a large pot with 3 cups of water. Bring to a boil, then reduce heat and simmer for 30 minutes then drain and add to a large bowl. In a separate small bowl, stir together the vinegar, oil, salt, pepper, mustard and honey. Pour over the farro and stir to coat. Add in the strawberries, blueberries, onion, feta, and mint and stir to combine. Refrigerate until ready to serve. Once I tasted the Apricot Ginger Mustard I just knew I had to build a recipe around it. 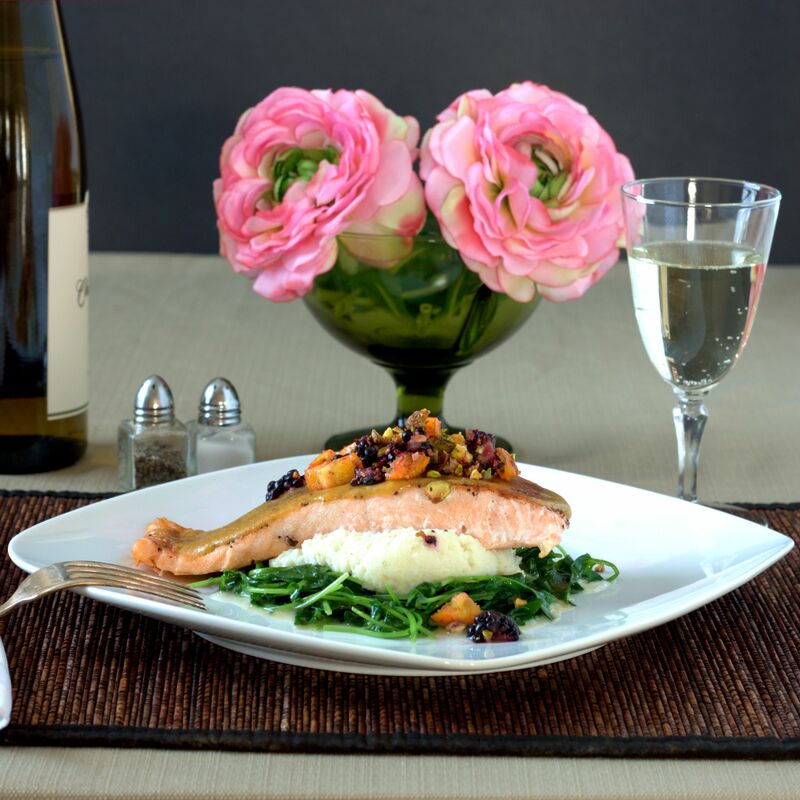 The sweetness of the apricot and zing of the ginger are perfectly balanced, which I thought would make an excellent topper for salmon. 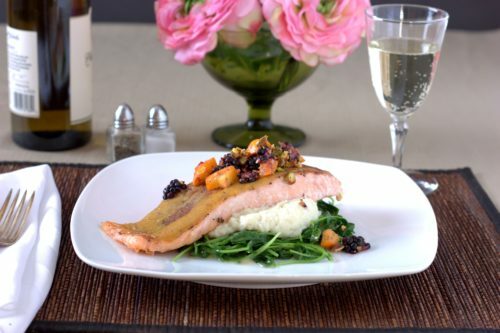 I complimented the Apricot Ginger Mustard with a bit of Saigon cinnamon and I divided the cooking time of the salmon between searing for a textured crust and baking for even tenderness. 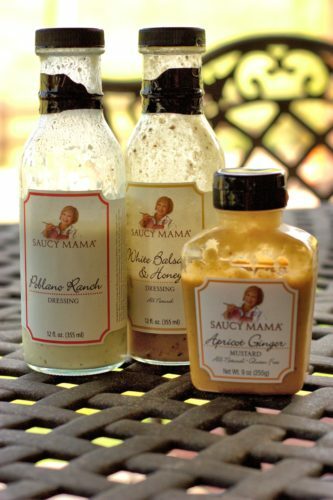 Even though the Apricot Ginger Salmon is the main attraction, I utilized two other Saucy Mama products in the equally as tasty accompaniments. A cauliflower puree with the consistency of mashed potatoes earns its flavor from the Poblano Ranch Dressing, and the watercress that has been wilted to tame its spiciness (and pack in more servings per plate) is tossed with a bit of White Balsamic & Honey Dressing. The plated dish, which was garnished with a dusting of kumquats, blackberries, and pistachios, made my husband utter an audible “wow”, which is always a welcome compliment to any cooking contester. Even better, he said he felt like he had dined in a fancy restaurant – I just hope the judges agree with his review! In a small bowl, stir together the pistachios, blackberries, and kumquats; set aside. In a separate small bowl, stir together the salt, pepper, and Saigon cinnamon; set aside. Place the cauliflower and water in a microwave safe bowl with a lid and microwave for 6-8 minutes, or until cooked throughout. Drain the cauliflower than add to a food processor. Process the cauliflower until rice sized chunks are formed, pour in the Poblano Ranch dressing and then process again until smooth; keep warm. Place a cast iron skillet over medium-high heat. Pat the salmon filets dry, then sprinkle the salt mixture evenly over the top side of both filets, spreading with your fingers to cover the entire top evenly. Once the cast iron skillet is hot, place the salmon filets in the pan, salted side down, and sear for 3 minutes. Turn off the stove, flip the filets over, top each filet with 1 tablespoon of the apricot-ginger mustard, spreading evenly over the entire surface, then transfer the skillet to the oven and bake for 6 minutes. While the salmon is baking, melt the butter in a large saute pan. Add the watercress and cook for about 2 minutes, stirring frequently, until watercress is just wilted. Add the Saucy Mama white balsamic & honey dressing and stir to coat. 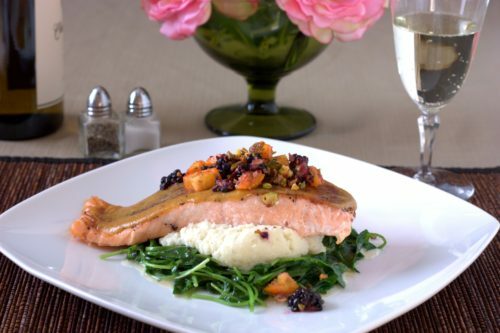 To plate, divide the watercress between two plates, top with even amounts of the pureed cauliflower, then place one salmon filet over each pile of pureed cauliflower. 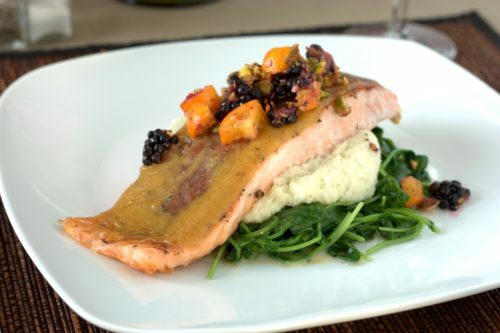 Evenly sprinkle the kumquat relish over both filets and serve immediately. The start of the New Year brings renewed, optimistic goals in addition to wishes of good will for family and friends. As I mentioned in last year’s lentil salad post, there are some food dishes that are traditionally eaten on New Year’s Day as a symbol of good luck. One such dish is a combination of black-eyed peas, greens (such as collard greens or another leafy item), and a pork item, such as bacon. While the history of the tradition may be a bit murky, and its true impact on good fortune untraceable, I embrace the opportunity to consume a food item that I haven’t thoroughly explored – the black eyed pea. Instead of making a traditional Hoppin’ John or salad, I opted for a pasta dish, which I have dubbed Lucky New Year Penne Pasta. I also swapped collard greens for chard and ham hock for prosciutto for an Italian rendition of the prosperity trio. I added the black eyed peas to my pasta water prior to the pasta, to make sure they had extra time to soften, and I added the chard at the last minute of cooking to just barely wilt the greens. 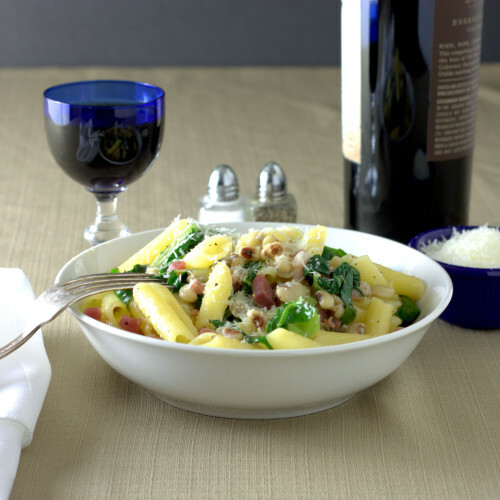 The pasta gets smothered in a lemon butter sauce that is flavored with onions, prosciutto, basil, and pecorino Romano, giving it a fresh and light taste. My exploration of a newer food – the black eyed pea – made me realize that I should use it more often. 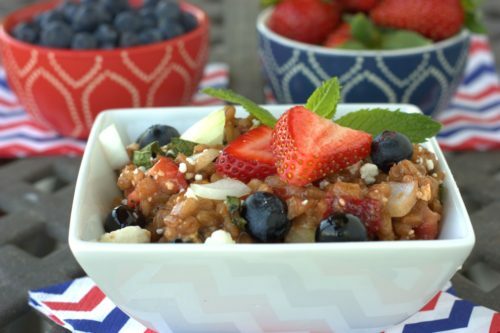 It has a mild taste, which means that it can easily be masked by stronger ingredients while offering a budget friendly way to add needed protein and fiber. 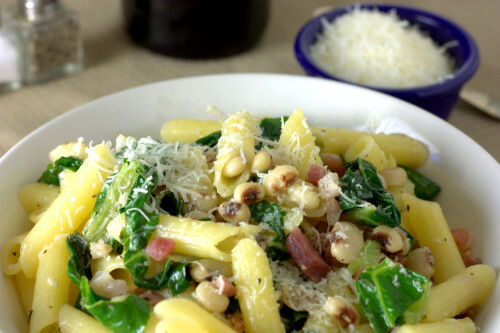 Whether you try my Lucky New Year Penne Pasta, sample another unique black eyed pea dish (such as this curry from Strength and Sunshine), or opt out of “lucky” dishes all together, may your New Year bring success and happiness! Bring water to a boil in a large pot. Add the black eyed peas and boil for 10 minutes. Add the pasta and boil for an additional 11-13 minutes, or until tender. While the pasta is cooking, melt ¼ cup of butter in a non stick pan, and add onions. Saute onions for 8-10 minutes, or until just begin to brown. Add the remaining butter, lemon juice, dried basil, salt and pepper to the onions and bring to a simmer. During the last minute of cooking for the pasta, add the chard, then drain the pasta once the chard has wilted and turned vibrant green; transfer to a large bowl. Add the prosciutto to the butter sauce, saute for 1 minute, then pour over the pasta and stir to coat. Sprinkle on the pecorino Romano and stir to coat. 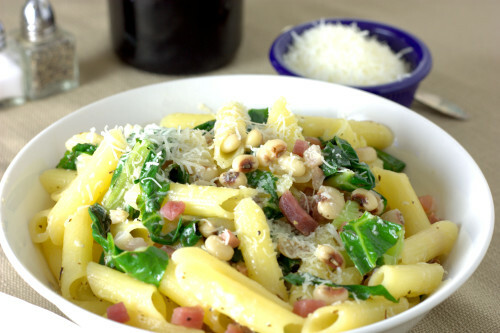 Serve with additional pecorino Romano, if desired. 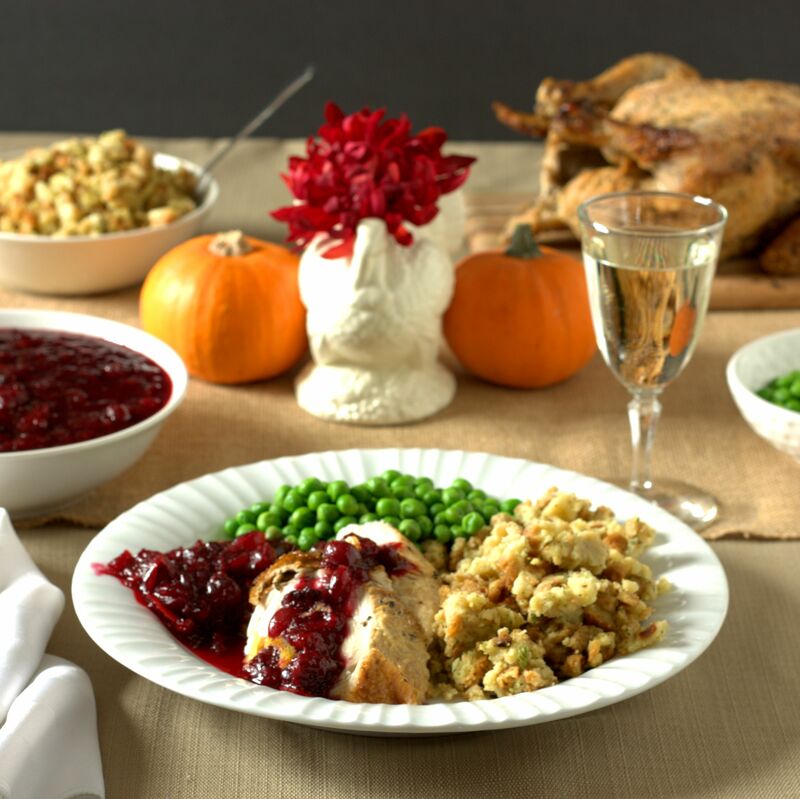 Cranberry sauce is usually a staple at a Thanksgiving meal. 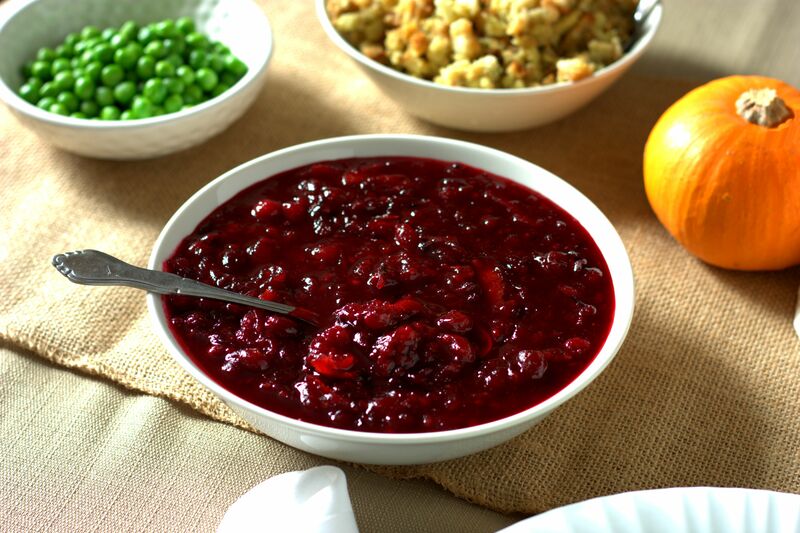 The bigger debate around this popular side dish is typically canned, jellied version vs. homemade, whole berry cranberry sauce. While I like both, I really enjoy the flavor variety you can add to homemade sauce. Plus it is super easy. For this year’s meal I wanted to add a second type of berry. I chose blackberry since it also goes well with poultry. 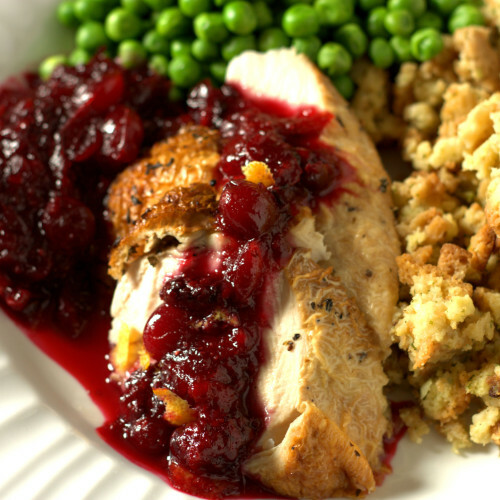 In addition to blackberry, I added a hint of hibiscus and orange zest (which I cut in larger chunks rather than finely grating the peel), resulting in a very ruby colored and delicious Blackberry-Hibiscus Cranberry Sauce. The exotic flavored cranberry sauce has been a fun treat to enjoy all week, both as a sauce for my turkey and stirred into my morning parfait. 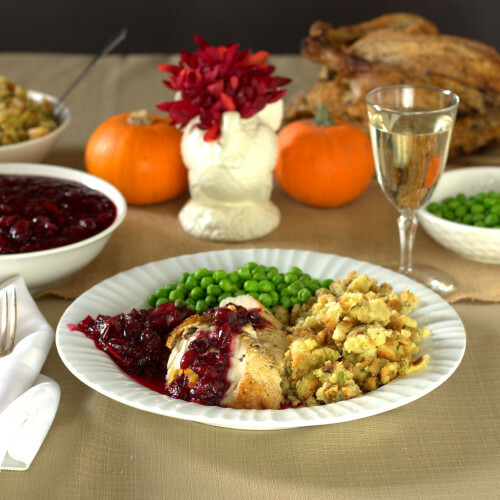 Even if you are a lover of the canned variety, I encourage you to give this cranberry sauce recipe a try! Place all of the ingredients in a large sauce pan and bring to a boil. 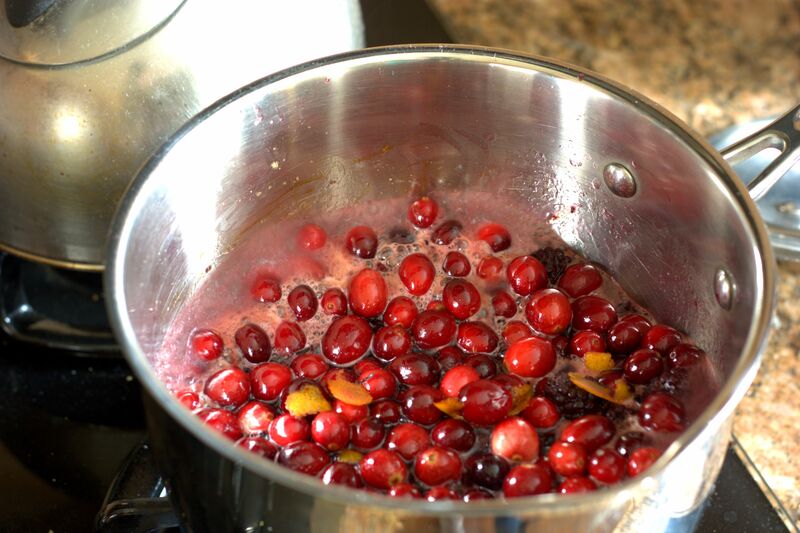 Reduce heat and simmer for 15-20 minutes or until the cranberries skin begin to burst and sauce thickens. Remove from the heat and transfer to a bowl. Let cool, then store in the refrigerator until ready to serve. 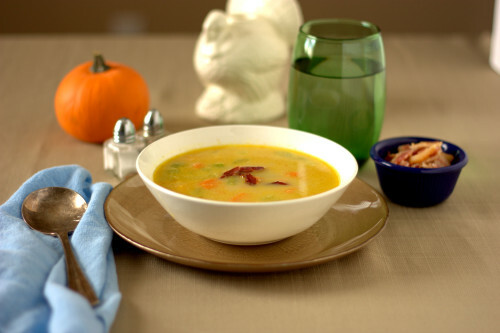 For the first course at my Thanksgiving meal I usually start with a festive salad, but this year I wanted to try a soup. While smooth, root based soups typically abound for the holiday meal, I wanted to go for a chunky, curry corn chowder. One of the key ingredients I wanted to use is sweet potatoes. I LOVE sweet potatoes, but my husband doesn’t care for them. Somehow that doesn’t stop me from picking up a large bag full this time of year. My thinking is that if I sneak them into a soup so filled with other vegetables, maybe he won’t even notice that they are there. 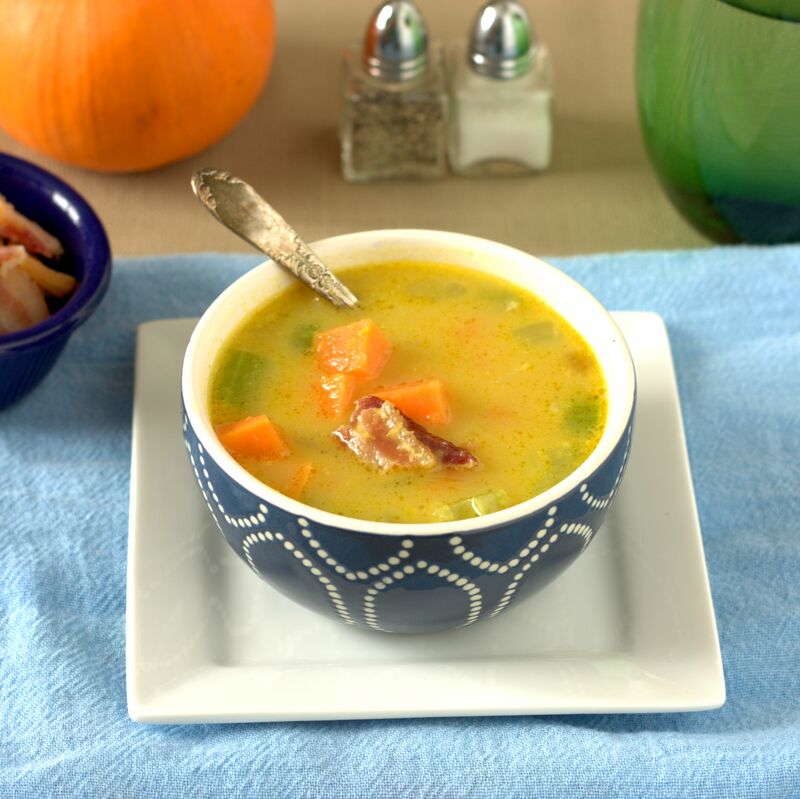 In addition to the sweet potatoes, I used a variety of other vegetables: carrots, celery, onion and corn, plus acorn squash to thicken the soup, eliminating the need for flour or corn starch (whoo hoo – gluten free!). To give it a kick, I stirred in just a bit of hot madras curry powder. 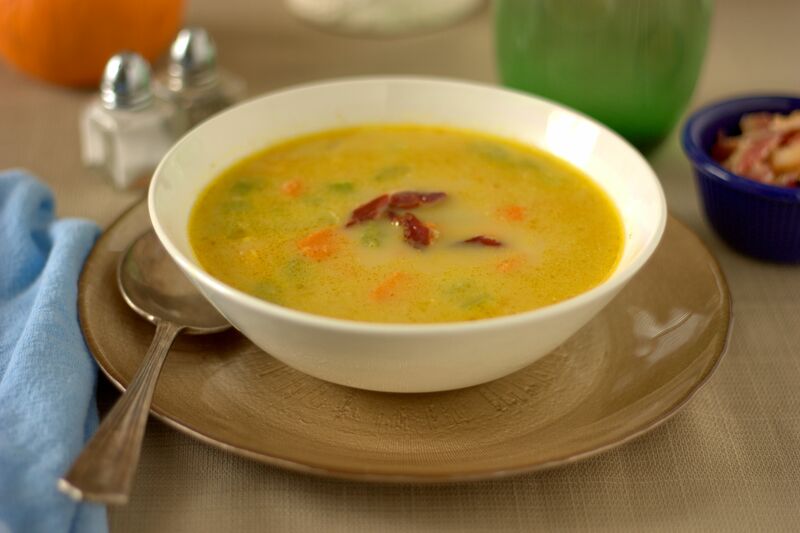 Not only did it add just a hint of exotic flavor, it ramped up the golden hue of the soup. The resulting sweet potato & curry corn chowder is a perfect start for a Thanksgiving meal – full of fall flavor yet not too rich that you can’t enjoy the rest of your meal. But why wait for a holiday meal? 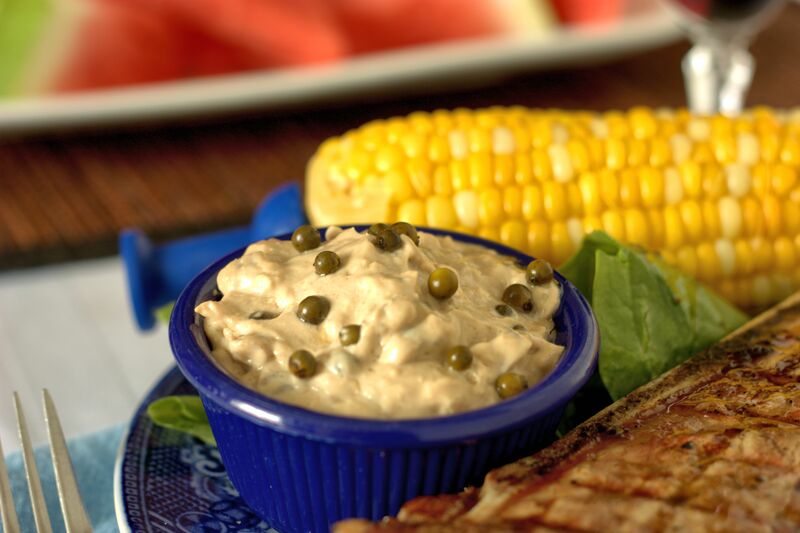 It is easy to whip together and is a great addition to any dinner feast or a tired lunch box. Preheat the oven to 350 °F. Cut the acorn squash in half and place cut side down in a 9×13 inch pan filled with 1 in of water. Roast for 1 hour or until flesh becomes soft. In a large pot, melt butter over medium-high heat. Add the shallots, celery, and carrots. Saute for 3 minutes to soften, then add garlic and saute for 1 minute longer. Add the sweet potato, corn, stock, and cashew milk and bring to a boil. Boil for a few minutes or until the sweet potato pieces are tender. Scoop the acorn squash flesh from the skin (equals about 3 cups) and add to a food processor, along with 1 cup of hot liquid from the soup. Blend the acorn squash until smooth, and then add to the soup pot; stir to mix evenly. Add the curry powder and salt to the pot, stirring to evenly distribute. Ladle into bowls and serve with crumbled bacon, if desired.